Fellowship Previews: ComicWow Assembles Super Team for Charity Event! ComicWow Assembles Super Team for Charity Event! 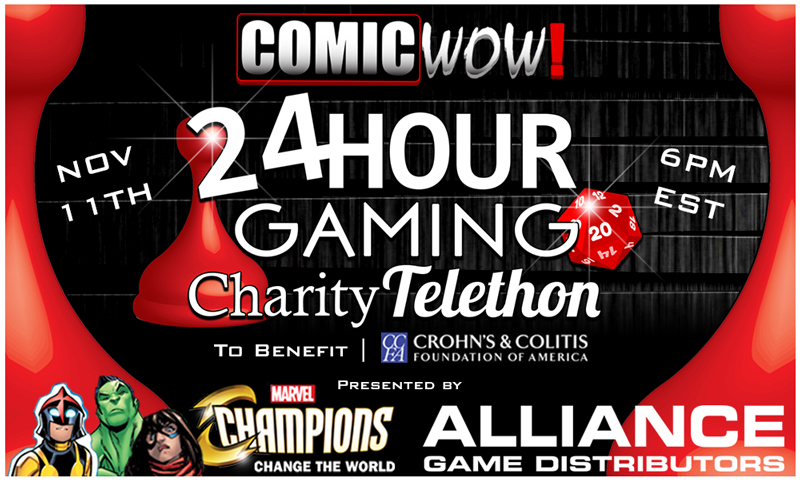 ComicWow has gathered a team of comic readers and tabletop gamers for a 24-hour live stream to benefit the Crohn's & Colitis Foundation of America (CCFA.org). The live stream will take place at the ComicWow studios from 6pm EST on Friday, November 11th to 6pm EST on Saturday, November 12th. This live event has been made possible by numerous sponsors. Title sponsors Champions from Marvel Comics and Alliance Game Distributors are leading the team. Event sponsors include IDW, BOOM! Studios, Hot Flips, Renegade Game Studios, Diamond Select Toys, and Red Bull. Prize sponsors (whose items will be given away in prize packages) include ComicWow, Skybound, Funko, Diamond International Galleries, Gemstone Publishing, Fireside Games, IELLO, Cheapass Games, Wizkids, Dynamite Entertainment, Paizo, Death Wish Coffee, Cryptozoic, Blue Juice Comics, Archie, Calliope Games, CGE, Choice Collectibles, and professional cosplayers. ComicWow President Josh Geppi stated that he is "so thankful for all of [ComicWow's] sponsors. It was great to get so many, especially title sponsors, Marvel's Champions and Alliance Game Distributors." There is no shortage of prizes for viewers, Twitch subscribers, and donators alike. ComicWow will be giving away a prize package every eight hours with a retail value of up to or over $2,000 each. Every $20 donated will get a viewer one entry, $100 will get seven entries, and winners are chosen at random via computer software. Other prizes will also be given away throughout the day and night, so make sure to donate whenever you can through ComicWow's donation page, www.comicwowcares.com. This stream will feature your friends at ComicWow, cosplayers that you've seen on Cosplay Poker and Epic Quests RPG, as well as tons of volunteers that have been kind enough to give their time to charity. It's going to be "a lot of good people coming together for a great cause, and chances to win items from your favorite sponsors," says Geppi. "Hilarity will ensue." For more information on ComicWow and the 24-hour live stream, visit www.comicwow.tv or contact Richard Ankney at (443) 318-8451 or arick@comicwow.com.